This is mainly here for historical reference. 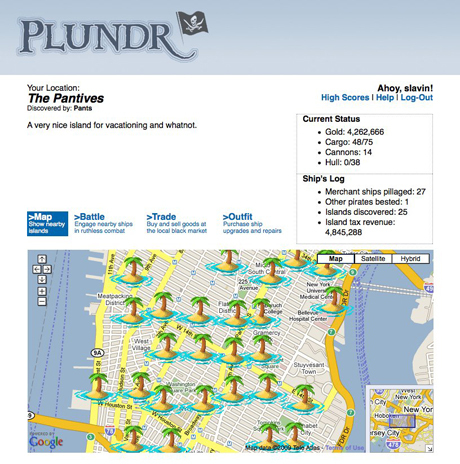 A long time ago (2007), while interning at Area/Code in New York, I programmed and did some game design work on Plundr, the world’s first location-based browser game. It was a great time and I learned a lot. The game is a pirate adventure in which players move from island to island to buy, sell and fight for goods. Depending on where you are in the physical world, you’ll find different islands, different market prices and different ships to fight. Technically, location awareness was not built into anything yet - we used a service by Skyhook to look up location data through the user’s wifi connection.